Bicycle Kits are being distributed to new adult riders and child riders who are attending educational bike classes. Cecily has set up Centre Region as an advocacy area for the National Bike Challenge which will take place from May to September 2018. Cecily also distributed red bike seat covers from Fixation by Saris. If you see one around town, snap a selfie with it and email the picture to seatcovers@saris.com to give State College a chance of winning $1,000 for cycling infrastructure. More info can be found here. Puddintown to Orchard ribbon cutting this past friday, 61 attendees w/ 20 bikes and 3 dogs. 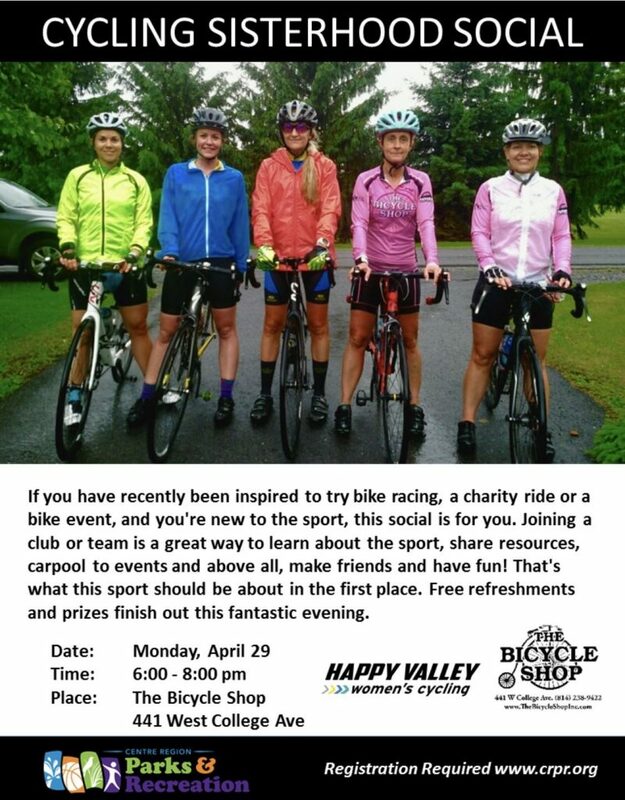 All 3 bike shops provided fabulous raffle prizes. 1st COG Bike to Work Day will be this Friday! 34 donors contributed $1,895 to CentreBike! Thanks Michele! Donors received a membership from donating: 19 members renewed through this campaign, 3 new members from Facebook, 6 new members from the mailing list, and 7 completely new members! Unable to attend today, but looks forward to attending a meeting soon. Lanespotter is a crowdsourcing bike route app! Pro-bike political/motivational yard signs could be ~$15/sign, however bulk pricing is worth looking into. Put out call for what people would like to see and vote at the next meeting. Cookout will be held at Paul Rito’s house in lieu of a June Meeting on June 11 at 5:30. RSVP HERE. Vote passed to spend no more than $150 on main foods for this; Andrew Artz made the motion, Paul Rito seconded the motion, and members voted in favor! CentreBike would like to post bios/stories about our members! Submissions can be sent to any Executive Committee member. Send pictures to! Prompts can be provided if needed.